Last Friday Project Connect presented the final “Locally Preferred Alternative” to the mayor’s Central Corridor Advisory Group. As expected for months, it connects East Riverside to Highland Mall along the east side of downtown. While I believe this is a bad plan, and have been heartened to hear new voices espouse similar sentiments, I have been somewhat perplexed by the calls for rail to connect to the airport by both pundits and apparently the general public as well. This entry was posted in Observations and tagged Project Connect, transit on May 8, 2014 by syarak. 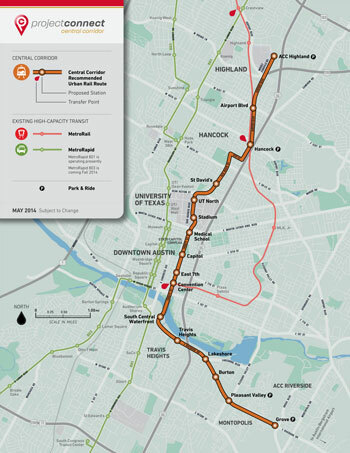 As readers are likely aware, Project Connect made their recommendation for the first phase of urban rail Austin’s next transit investment last Friday. Many others have written about the selection. This entry was posted in Observations and tagged Austin, Project Connect, transit, urban rail on November 20, 2013 by syarak.